At Dashbot, we understand the importance of enhancing your bots to create the best bot experience, one that continually engages and retains users. The biggest challenge here is understanding how well your bot handles user queries and, more importantly, understanding what messages your bot doesn’t currently handle. This is why we’ve launched our new ‘NotHandled’ report, which you’ll find under your Conversations tab. Dashbot’s NotHandled report enables you to understand how your bot improves over time by showing you how many messages your bot doesn’t handle and what percentage of your overall message volume is not handled over time. As you continually improve your bot and add support for new use cases, these improvements will be reflected in the percentage of NotHandled messages. 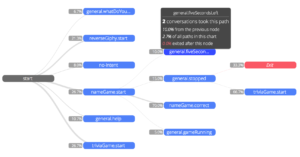 Beneath the chart, you’ll find the actual messages that your bot could not respond to and what percentage of those messages were included in your incoming messages. You can then add support for these specific messages to reduce the percentage of NotHandled messages, creating a frictionless bot experience and resulting in fewer frustrated users and higher engagement. As you continue to improve your bot’s ability to handle every message that comes through this report, the green line should begin trending downward and those messages will start disappearing. Now that you’ve implemented intents, you can take advantage of additional reports such as the Intent Funnel, Top Intents, and Conversation Paths to continue to drill into intent activity.